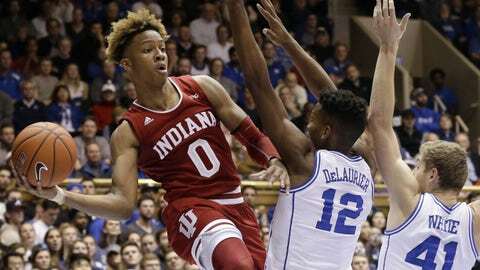 Romeo Langford scored 13 points on 3-of-15 shooting to lead the Hoosiers. DURHAM, N.C. — Zion Williamson jumped a lazy pass by Indiana near midcourt. All of a sudden, nothing stood between him and yet another must-see dunk. Tre Jones added 15 points and a fourth Duke freshman — Cameron Reddish — finished with 13 to help the Blue Devils (6-1) bounce back from their lone loss and win one of the made-for-TV event’s glamour matchups. This one featured a handful of potential NBA lottery picks — the Duke freshmen and Indiana’s Romeo Langford — on the floor at the same time. Duke looked nothing like the group that lost to Gonzaga last week in the Maui Invitational final. The Blue Devils never trailed, shot 52 percent and turned a season-worst 20 turnovers by Indiana into 24 points. Langford scored 13 points on 3-of-15 shooting to lead the Hoosiers (5-2). But No. 2 scorer Juwan Morgan, who averages 17.5 points, was in foul trouble all night and finished with eight. Indiana trailed by 24 points at halftime and never got closer than 19 in the second half. Indiana: Langford and the Hoosiers couldn’t get anything going on offense. Indiana, one of the nation’s best shooting teams at 55 percent, shot a season-worst 39 percent. In the first half, the Hoosiers made just 11 of 33 attempts and turned it over 13 times while falling into a deep hole that few visitors to Cameron Indoor Stadium ever escape. Duke: Williamson and Barrett — the nation’s only freshman teammates averaging at least 20 points apiece — took command again on offense. But what really made this a complete victory for the Blue Devils was how dominant their defense was, especially after the Gonzaga game. Duke forced a season high in turnovers and held Indiana to a season-low point total. That highlight-reel play by Williamson came when Rob Phinisee threw a lazy pass to Fitzner — who immediately slouched his shoulders as Williamson jumped the pass, perhaps knowing a spectacular dunk was coming. That breakaway windmill sent Cameron into a tizzy and put Duke up 38-22. Better days are ahead for Langford, even if his first — and likely only — visit to Cameron was one to forget. His 12 missed shots were the most of his brief college career, but it was one sequence at the other end of the floor that encapsulated his tough night. Barrett put up a shot over him. But instead of getting a body on the Duke freshman, Langford seemingly stepped aside to give Barrett an unimpeded path to the rebound. Barrett eventually stuck back his own miss to put the Blue Devils up 29-15. This could have been even more lopsided had Duke not shot just 59 percent from the free-throw line. … Indiana has never beaten Duke in the challenge, falling to 0-5. “I knew it was coming. Y’all seen him once before, I’ve seen it a thousand times. … Every single time, unbelievable.” — Reddish, on Williamson’s windmill dunk. Indiana: Hosts Northwestern in its Big Ten opener Saturday. Duke: Hosts Stetson on Saturday night.